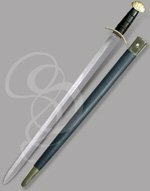 What is the greatest symbol of the Viking people? No, not the horned helmets. The Vikings didn't actually wear horned helmets. What? No, no, not the longships. Well, sort of the longships, but that't not what I'm getting at here. Yes, right, the spectacled helmets were pretty popular, too. True. But what I meant was ... What's that? 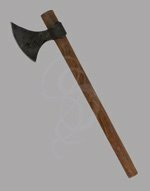 Oh, right, right, the axes were a pretty defining characterisic, yes, right you are, but ... oh, correct, of course the lobed swords were a big part of the Viking mystique ... but ... ALL RIGHT! KNOCK IT OFF! Go ahead and ruin my lead. I hope you miscreants are happy. I guess you would prefer this, then? Shields were very important to the Vikings. They used them often and well. They really liked their shields. I like Viking shields, too. I hope someone buys me a Viking shield for Christmas. Not very exciting is it? Then for Odin's sake, just play along, will you? You already know what the page is about, so stop trying to ruin it. This viking shield is a wonderful and accurate replica of an early Viking shield. Made from thick, stained hardwood, the shield is probably stronger than the actualy shields made in the 8th and 9th centuries. It's most prominent feature is the steel rim, a feature that was found in only the most extravagant of Viking shields (and a most effective one I might add. And, while I'm adding things, please, please help me, they keep me strapped to the bed here for 12 hours a day and feed me all sorts of strange medications. Please, contact my lawyer at ... oh no, here she comes... Ahem...) So, Viking shields. Very very impressive those Vikings shields. Whoo weee. I'm just sitting here writing about Viking shields. Hello Nurse! 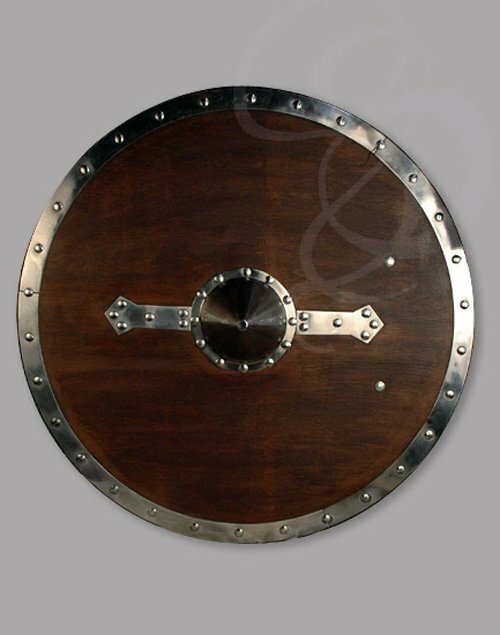 The shield also features a historically accurate steel boss on the front, used by the Vikings to protect their hands against blows that made it through the wood of the shield. The pointed shape of the boss would have been ideal for deflecting swords, spears and axes. The shield features steel reinforcements along the boss for more durability and strength. The back of the shield is lined with a thick felt for comfort and to prevent scuffing and scratching if you choose to mount it on a wall. A strong leather arm strap ensures a firm grip and a securely bolted wood handle lines your hand up with the boss. Brilliantly designed and masterfully crafted, this Viking shield will outlive you and your children if cared for. Materials: Polished and stained hardwood. Felt backing. Leather arm strap and securely fastened wood hand grip. Steel boss,rim and reinforcements. Size: 29 inches in diameter. 1/2 inch thick.